Twitter has come a long way in standardizing the header display across various devices (YAY! ), so I rewrote in September 2016. 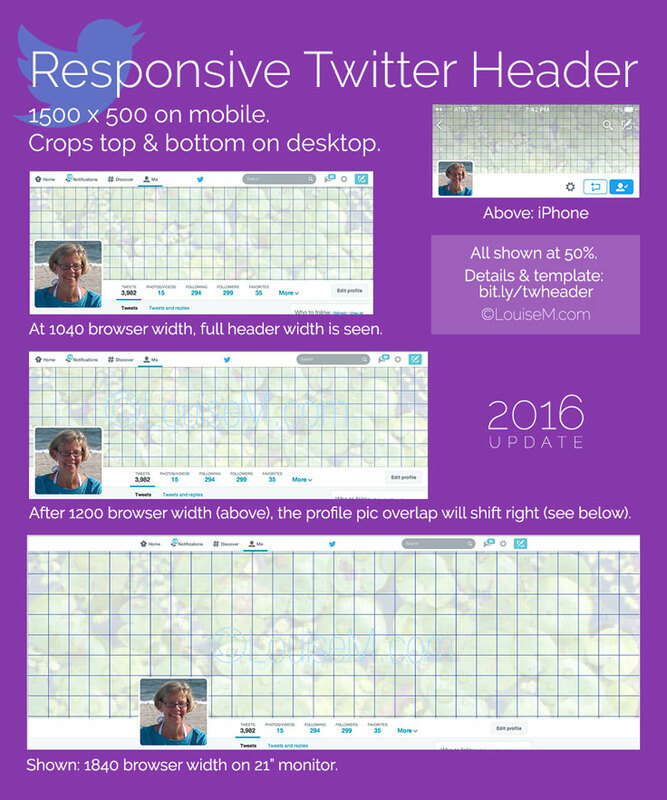 Take a look, and download the current 2016-17 Twitter header template! The full width of your Twitter header will be seen at a minimum browser width of approximately 1040 pixels (as pictured below). The header will enlarge as the window enlarges – to 5 inches high at full width of a 21″ monitor. That’s BIG! The header size to create is 1500 x 500 pixels, though it will get cropped top and bottom on desktop. The exact cropping will vary depending on the viewer’s browser width, but plan on 40 to 60 pixels each top and bottom. DON’T create the header at a reduced height though! NOW, in 2017, the 1500 x 500 image shows in full on my iPhone. If you don’t want to mess around figuring out the proper dimensions, Snappa‘s easy graphic design tool has all of the dimensions and safe zones built right in. You can try it for free here. If you “go Pro,” I’ll receive a commission. On desktop, the header size changes dynamically as the browser window is enlarged or reduced, and the top / bottom cropping varies slightly as it changes. See 3 browser widths compared below. I added grid lines every 50 pixels so you could see the cropping change. I also reduced the headers in proportion to each other. Pin this for reference! This comparison chart also shows that you can’t pinpoint where the profile picture will overlap the header, as it will vary depending on the user’s browser window width. I created a Twitter header template for you, showing the possible cropping and overlap on desktop. Keep those shaded areas clear of type and important details! Right click the image below to save to your hard drive. 2016-17 Twitter header size template. Right Click the image to grab the full-size template. After designing your Twitter cover photo in Photoshop, PicMonkey, or Canva, I suggest you save as a PNG file for top quality. Twitter will compress your image, leaving unsightly compression artifacts – so start with the highest quality image you can. To upload your new Twitter header, click the Edit Profile button that appears at the far right of your profile picture when you’re logged in. If you upload a smaller header photo, there’s a slider to enlarge it, and you can adjust the cropping by clicking on your image and dragging. I strongly recommend uploading at least 1500 pixel width for best image quality. Wider images will automatically be reduced to fit the width, but you can scale them up with the slider if desired. Your “join date” will appear under this text on the left of your profile page, and can’t be edited. Below that are your 6 latest photo and/or video thumbnails. Your Twitter profile picture size has increased as well. Twitter suggests uploading 400 pixels square. You can’t go wrong with bigger, for better photo clarity. The font size for tweets was enlarged in Spring 2014, and tweets that are getting more engagement are larger yet! Note the difference in font sizes seen below. Pinning a tweet, like a pinned post on a Facebook Page, is a nice added feature. Simply click on the elipsis (…) under the tweet and choose Pin to your profile page. Now it will stay at the top of the tweet stream on your profile page. Pin a tweet with a valuable call-to-action for new visitors to your page! After the 2014 redesign, you could see your former background image on your Home feed (shown below), Notifications, and Discover page. This has been discontinued. Now all backgrounds are the same pale gray as your profile page (see top image). They can’t be edited. What If I Don’t Create a Twitter Header? 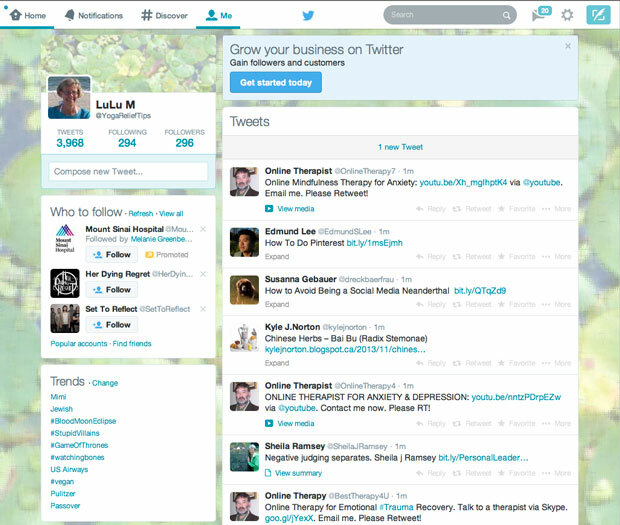 My recommendation: create a new Twitter cover photo each time you have a new promotion. Seen my latest tweets? You should check it out and follow me here! 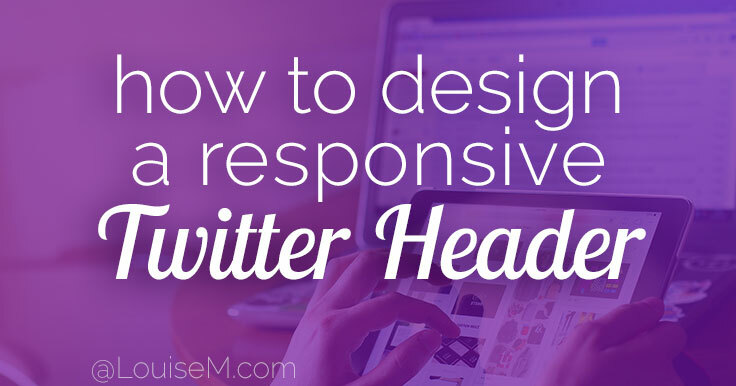 Are You Ready to Create a Twitter Header? Confused yet? If you don’t want to fool around trying to figure out the proper dimensions, Snappa‘s easy graphic design tool has the sizes and safe zones built right in. Making your design work – a snap! 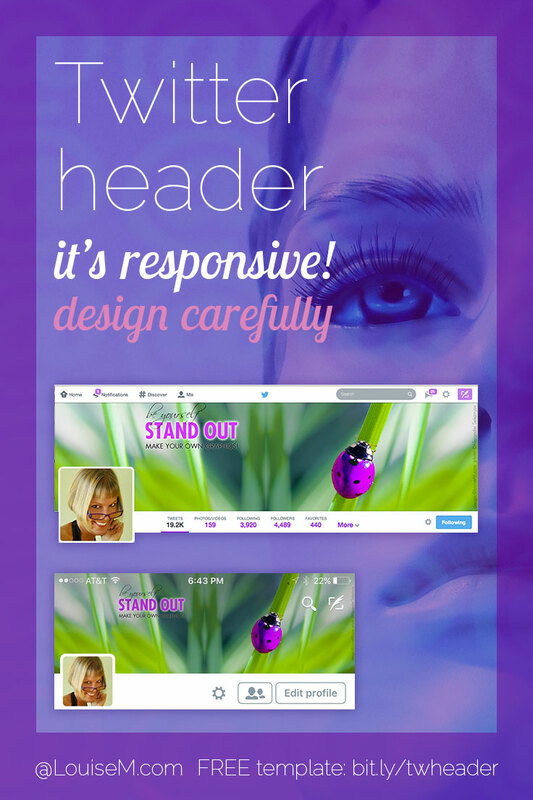 You can try it for free here, to quickly make your large and lovely responsive Twitter header. 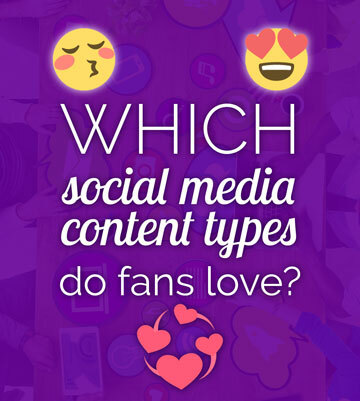 Share a link to your Twitter profile in your comment below! Louise, this post is terrific, and of course, very timely. Thanks for describing and calling our attention to how differently the header displays, depending on your monitor. We tend to forget that. Thanks for the template, makes my job easier when I have to make my new header. 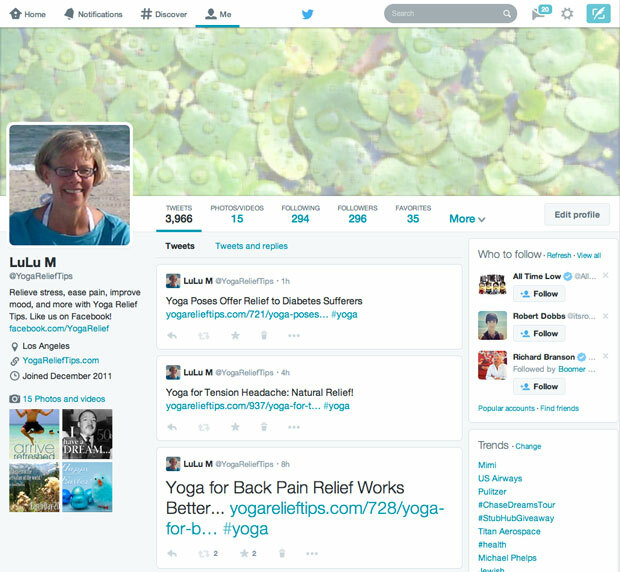 By the way, I am a follower on your Twitter @YogaReliefTips account. My hobby, that keeps me sane and balanced. So glad to hear that, Cristina! Thanks for taking the time to leave a comment. I appreciate you! Hi, I accidentally pressed the ‘turn it on’ button for the new layout. And now I can’t find any button to revert back to the old layout. Can you help me? Once you’ve approved the preview, I don’t know of a way to go back. Note that only people who actually visit your profile page will see it though. The pop-up preview maintains the 2013 design. Everyone will get this new design eventually, so I hope you don’t worry too much about reverting. If you do find a solution though, let us know! Why is it that my ” Date joined ” doesn’t appear in my profile? How strange! I checked and mine is still there. You could try asking Twitter, as I don’t know. Thanks for this great template (and all the examples), Louise. I was going to make my own template, but why bother when you’ve done such a great job. I’m going to tell everyone that asks me for a guide to check out this post. Thanks again! Thanks so much Rob! Appreciated. Great post, thanks Louise – we’ve read loads of posts about the most recent Twitter profile changes and resultant image sizes and yet almost all of them omit to mention that on mobile views, the middle of the header image will be obscured by their avatar! Amusingly, on Twitter’s own blog post announcing the changes, they used Michelle Obama’s twitter profile to illustrate the radical new layouts, but if you looked at that on a mobile, her avatar decapitated one of the school-kids that it featured, so looks like even they hadn’t quite got it right! Oh my, that’s a great story! So glad you found this useful, Dennis, and thanks for your comment and shares! Thank you so much for your help here, and for all your tips! I just created a Twitter header that was 1500 x 500. Twitter chopped it and it looked horrible. OK, so I created a Twitter header that was 1040 x 400. Twitter chopped it again and it still looked horrible. Have you had any experience with this? 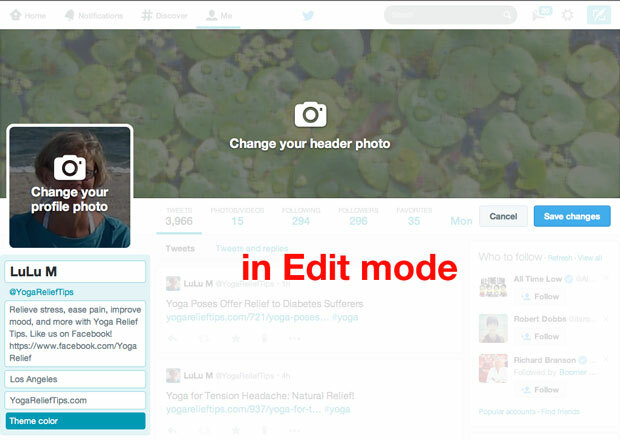 The Twitter header will crop differently on different devices and browser window sizes. I suggest you just stick with their recommended size and keep your image simple. My template should help if you need to position type or something you don’t want cropped or covered. But, unfortunately, we don’t have a lot of control over it. OK, I just tried uploading 1000 x 288 and Twitter was still cropping it. You’re awesome! Twitter is not (with regard to graphics and consistency). Of course maybe there’s just something I’m doing wrong. Im not understanding how to use the template for the twitter header. I have tries several ways to upload my 1500×500 picture and its still blurry! The template shows “safe areas” where text (or important details like faces) can be placed. You can use it as a semi-opaque layer in Photoshop. If using other software to design, you can only use it as a visual aid, unless you have the ability to place “guidelines” where I’ve called out. Not sure why your image is coming out blurry, sorry. Hi Louise – thanks so much for sharing your templates! The grid was a big bonus too. Really helped me in getting a balanced layout. One thing I did which others may find useful is to align text or graphic content edges with the margins of 200 px at left and right. As you showed, the way the header is displayed is a little random on different devices – but using your grid and aligning content at the 200 px margin markers meant my header was neatly aligned with the content below on iPad portrait view – it makes a very neat appearance, at least on iPad. See: @PeteEdmundsVO to see what I mean. Looks great, Peter! Very eye catching. I feel very silly, but I want to edit my Twitter header using my laptop but I can’t for the life of me find where I can do it. When I Edit Profile on my mobile device, it is clearly there. But when I Edit Profile on my laptop, I only see where I can change my profile picture, not my header. What am I doing wrong? Sorry but I have no idea. When I click Edit profile on desktop, I see very clearly Change your header photo. Such a well researched and thought out website full of great tips and practical templates. Thanks so much Louise. I have the template you provided, is there a certain resolution (300dpi) that works best at those dimensions? Mine is still blurry. No ppi needs to be set, devices will display at whatever their ppi is. I just use 72 but it doesn’t matter for web / mobile display, only print. Hmm…not responsive to me. Doesn’t change on desktop in newest Chrome, when I resize window. Doesn’t change in newest Firefox in Responsive Design Mode. Doesn’t work on my phone. Weird! I’m on Chrome Version 62.0.3202.94 for Mac and it still does the resizing thing. Your tools are a BIG help to the community. Thanks, for the update Louise. Hey Parker! Thanks for your kind comment. This article is fantastic! thank you so much! Thank you for your articles about the “craziness” of social media images sizes. Yes, this is still the recommended size.